The Montana Real Estate Salesperson Exam is split into two parts. The first part is the real estate salesperson national exam and the second part is the real estate salesperson state specific exam. The national portion of the Montana Real Estate salesperson exam is comprised of 100 questions. In order to pass the exam an examinee must answer 80 out of the 100 questions correct to pass (80% correct). The state specific part of the Montana Real Estate Salesperson Exam is comprised of 33 questions and an examinee must answer 23 questions correct to pass (70% correct). The time limit allowed for both the national and state specific part of the Montana Real Estate Salesperson Exam is 3.5 hours. 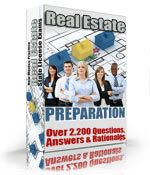 Real Estate Salesperson Exams in Montana are administered by AMP inc. exams at www.goamp.com. Before registering with AMP for the Montana Real Estate Salesperson Exam you must first review the link below to confirm your eligibility. The Montana Real Estate Salesperson Exams are taken by computer and you will receive your results immediately after finishing the exam. The exam is closed book. Remember to bring a simple functioning non programmable calculator since 10% of the exam may require some type of calculation. The registration fee to take the Montana Real Estate Salesperson Exam is 110 dollars.